How practical is it to invest in Picasso’s art? Pablo Picasso’s distinct style is recognizable everywhere. His artwork has sold into the millions, making him one of the seminal artists of the twentieth century. He is best known perhaps for his uniquely colored cubist oil paintings but actually these only represent a small fraction of his work from 1908 to 1914. In total he produced thousands of artistic images. It’s hard for most people to think about owning a work of art by Picasso but given his total life work of 16,000 artistic images, art aficionados all over the world are actually adding them to their collections even today. Most of these are works on paper – linocuts, etchings and increasingly popular, lithographs. Lithography is an art style developed based upon the antipathy between grease and water. The artist sketches an image directly onto stone, Bavarian limestone typically. Then ink is applied to the actual drawing. If more than one color is required, the artist then begins to use several stones. Finally paper is applied onto the stone. Picasso finally finished the Vollard Suite by 1939. 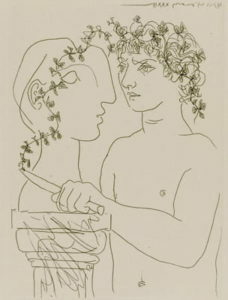 Two editions were made – one of 50 lithographs on large format paper and one of 260. They are all black and white etchings, beautifully created in a neoclassic style. In that particular suite, you’ll find works ranging from US 15,000 to 100,000. Monocle Radio assigned me to produce a radio story to on Asian art collectors who are investing in Picasso’s works on paper (lithographs). I learned some fascinating facts about how easy and economical it can be to invest in a Picasso. Here is a link to the podcast. Of course, the investigation piqued my own interest. Up until now, I have always held the view that purchasing art is subjective. You either like it or your don’t, so it’s not really worth buying it as a hedge because at the end of the day there is no guarantee that it will actually appreciate in value. Many of my South Asian friends are avid art collectors…so much so that every time I visit their homes and gaze at their walls adorned with the works of contemporary Indian artists, I feel like I have missed the boat. But then my practical husband never fails to bring me down to earth. He doesn’t think Indian art has universal appeal so why get all hot and bothered? I’ve checked with international art consultants and gallerists who all reaffirm one thing – there are indeed markets for different kinds of art but those markets are often limited to the genre of the artist. South Asians are indeed the predominant buyers of South Asian art…. as are the Chinese for Chinese heritage and contemporary art and Australians for Aboriginal art. But purchasing European masters is another story because these have universal appeal simply for their brand value. There will always be a market for a Chagall or a Matisse, so a rise in value is inevitable. The same goes for Picasso. I was particularly taken by Jacquelyn Chong’s comments, she doesn’t even like Picasso as an artist but when it comes to re-sale, she knows that putting her dollars into a Picasso graphic work is a her best bet. So after a few different due diligence trips to Collins & Kent International, I bit the bullet myself. I purchased a lithograph called Pommes, Verre et Couteau, better known in English as Apple, Glass & Knife. This original lithograph, was created in March 1947 and so dated in the lithographic stone. I have seen it once and then placed it directly into Collins & Kent’s rental program for the next couple of years. After that…well, we’ll see.